Adding a Watermark to your products on your Magento website would discourage copy cats and unscrupulous elements to copy your images on their own website. Now adding a Watermark using Photoshop would be big hassle and you can’t do that if you have thousands of Products. Don’t worry, Magento has the solution for you and we are here to help you. 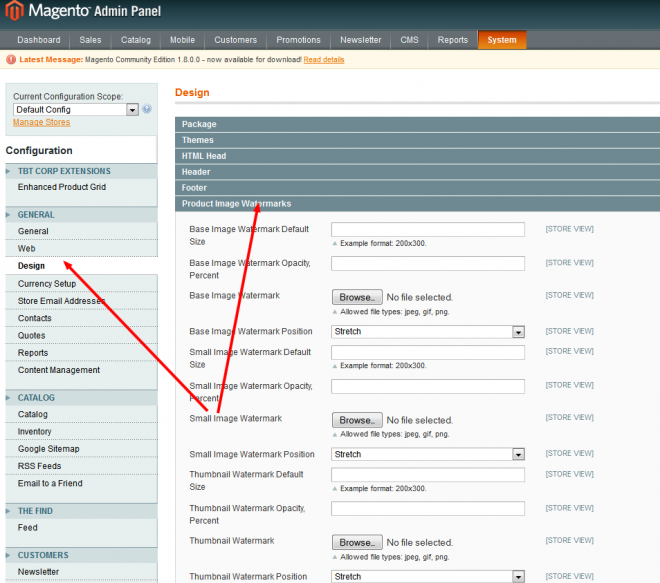 Go to Admin panel and select System > Configuration. In the Configuration panel on the left, under General, select Design. Enter the Watermark Default Size, in pixels. For example, 200 x 300. Enter the Watermark Opacity, as a percentage. For example, .40. Click the Browse button and select the watermark image file to upload.